Some hotel chains envision the Property Management Systems (PMS) to focus on its core functionalities (e.g., check-in/out and main operations), using open APIs for connectivity, while others encourage a high level of fully integrated systems such as CRS, RMS and CRM, eliminating the need for additional interfaces. As both strategies have their justification—every chain needs to go their own way—overall system performance remains dependent on the depth of integration with related systems, localization setup (e.g., including local tax and fiscal regulations), overall system cost and available staff skills. As a result, many solutions are often a compromise. But crucially, today’s guests increasingly expect hotels to recognize and meet their needs in a more proactive way, which presents a challenge for many chains. H2c’s Global PMS Report aims to shed more light on the current hotel management landscape via insights obtained from an online survey as well as expert interviews with hotel chains in Europe, the Middle East, North America and Asia Pacific. H2c’s research covers: (1) the hotel chains’ satisfaction level with their current PMS solution; (2) missing features and functionalities; and (3) changes required for improvement. The impetus for this study results from the increasing amount of PMS challenges hotel chains are facing today. Lack of support is not only a key concern but also a major driver for a potential system change. While h2c’s study results highlight the hotel chains’ requirements, the findings will also enable PMS providers to identify missing functionalities, prioritize their developments, and enhance their services. There are more chains likely to change their PMS strategy in the medium term than to retain it. The increasing demand for flexible cloud solutions with deep (especially CRM) integration capabilities has triggered a rethinking of hotel operations for the majority of hotel chains. Over the next five years, nearly three in 10 chains will change their PMS strategy. Slowly but surely, cloud technology is eliminating the painful upgrading processes of the past. For nearly half of all chains, the pain points (e.g., inefficient processes, missing functionality) with their PMS are large enough to justify a tender process (RFP). In addition, support issues and slow technical developments further encourage initiating an RFP. The willingness to conduct a tender is significantly higher in Europe and the Middle East than in Asia Pacific and North America. Nevertheless, immediate change does not seem to be an option, due to either a lack of technical alternatives or the unawareness of opportunities. 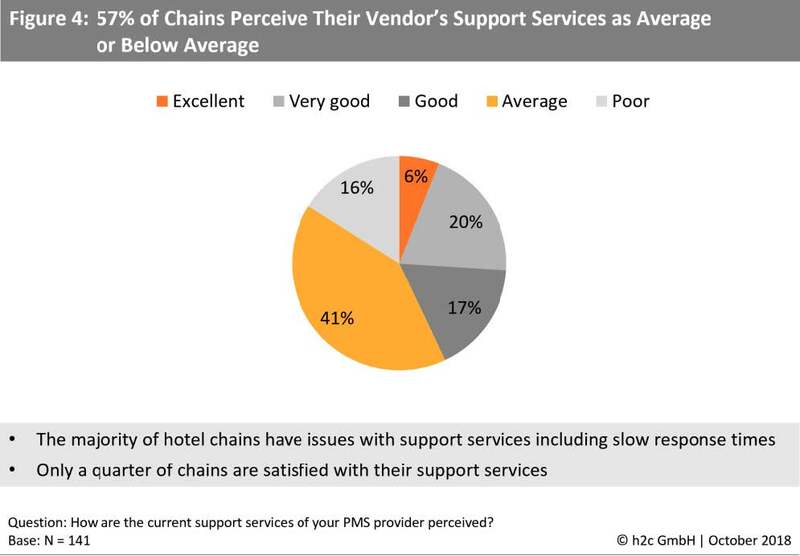 Three in 10 hotel chains experience insufficient support from their PMS vendor. Lack of support services (including slow response times, and inadequate consulting/problem-solving capability) is a major concern and has nearly twice the severity level of any other pain point. While technology deficiencies (integration, functionality and developments) present the second largest cluster of dissatisfaction, somewhat surprisingly, cost is of lesser importance to chains. Almost six in 10 PMS vendors scored either an average or poor rating for their support services. Just about one quarter of hotel chains are satisfied with the quality of support, mainly those in North America. Three quarters of European chains expressed their strong dissatisfaction with inadequate response times (most critical issue), followed by cost-efficiency, flexibility and the vendor’s general problem-solving capabilities. When asked which functionalities the PMS should focus on in the future, 58% of all chains ranked a deeper integration with their existing technology landscape as most important, followed by improved mobile functionalities (41%) and a more intuitive graphical user interface (GUI) for operations (36%). Enhanced business intelligence and personalization functionalities (e.g., custom dashboards) were requested by 34% and 33%, respectively. Driven by the increasing demand for flexible cloud solutions with deep integration capabilities (especially with CRM systems), a strategy shift becomes more likely for the majority of hotel chains. 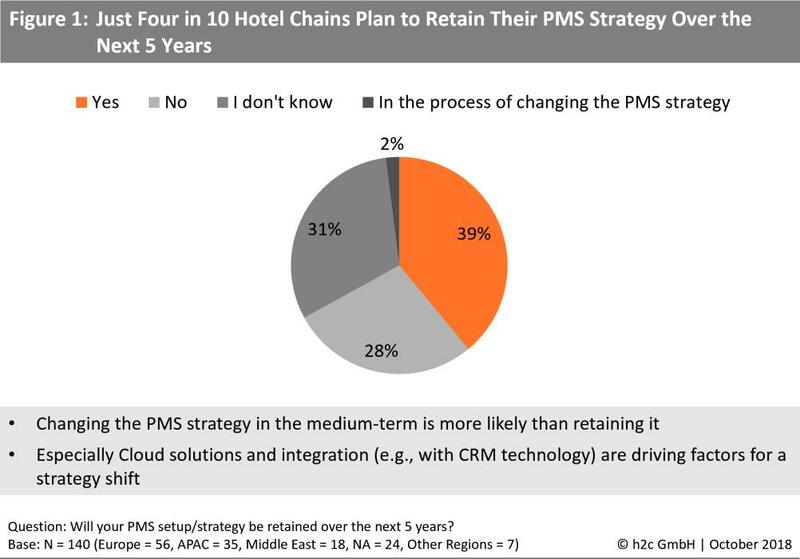 Almost three in 10 hotel chains will change their PMS strategy over the next five years (see Figure 1). Asia Pacific chains expressed the highest interest in changing their PMS setup (39%), followed by European hotel groups (34%). Just about four in 10 chains will maintain their strategy. The share of hotel chains without a clear vision of their future PMS is the largest in Europe. Slowly but surely, the industry is switching to cloud technology while eliminating the painful upgrading processes of the past. 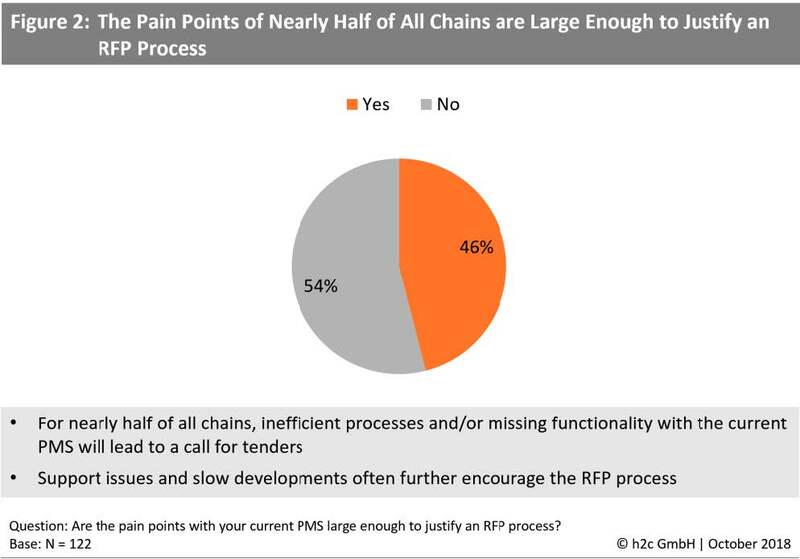 PMS Vendors Are Increasingly Facing Competition For nearly half of all chains, the pain points are large enough to justify an RFP process (see Figure 2). It is especially the case that inefficient processes and/or missing functionality with the current PMS will lead to a call for tenders. In many instances, support issues and slow technical developments further encourage the procurement of a new solution. The share of chains considering an RFP process is the highest in Europe (57%) and the Middle East (50%), while in Asia Pacific and North America only 36% are willing to initiate a tender. Nevertheless, the trend to change the PMS strategy over the next 5 years remains strong. However, timing does not seem to be right for immediate change, due to an absence of technical options or the chains’ unawareness of opportunities. Both situations can be tackled with stronger marketing activities by vendor companies and increased knowledge-building. 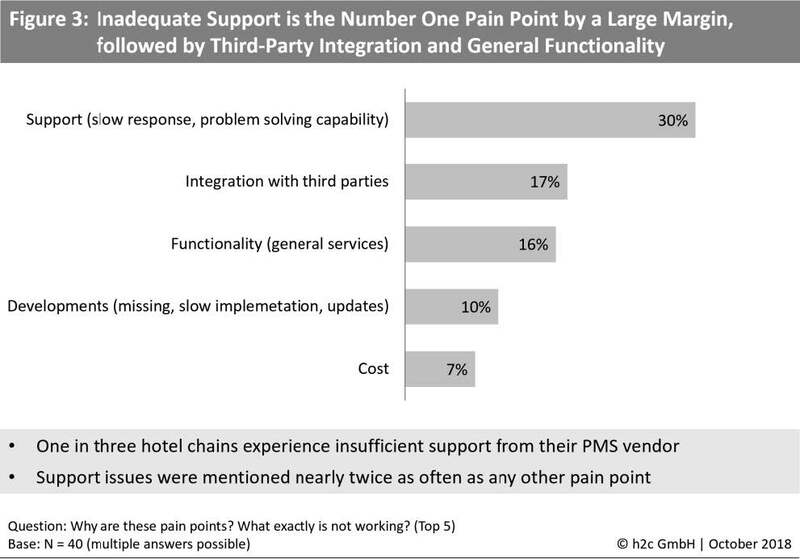 Three in 10 hotel chains experience insufficient support from their PMS vendor (see Figure 3). Support issues including a broad scope of criteria (e.g., response time, and consulting/problem-solving capability) are major concerns and more severe than any other pain point. While support and integration create the most problems for European hotel chains, cost and integration are the major pain points in the Middle Eastern region. After inadequate support, technology deficiencies (including integration, functionality and developments) pose the second largest dissatisfaction cluster. Somewhat surprisingly, high system cost seems to be of less importance. A clear majority (57%) of PMS vendors scored either an average or poor rating for their support services (see Figure 4). Only about one quarter of hotel chains are satisfied with the level and quality of support, mainly those in North America and Other Regions, both showing a satisfaction rate of 50%. Many hotel chains expressed their strong dissatisfaction with the (non-)offered services. Three quarters of European chains reported response times being either average or poor. Cost-efficiency is the second most critical issue, followed by flexibility (in response to urgent requests) and the vendor’s general problem-solving capabilities. 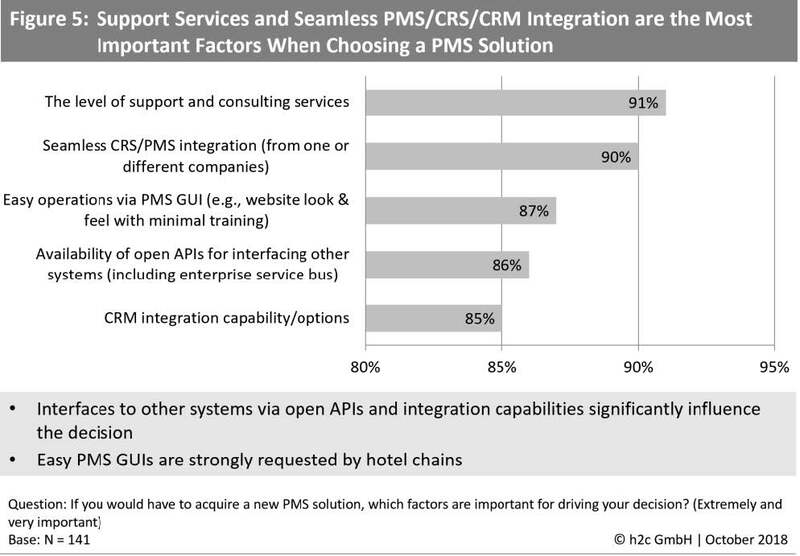 When asked which factors are important for driving the decision to acquire a new PMS solution, hotel chains pointed out the level of support and consulting services (i.e., problem recognition and solving) as their most important criteria (see Figure 5). Among other urgent needs are seamless CRS/PMS/CRM/RMS integration, easy operations via PMS GUI, and the availability of open APIs. 62% would like to have an influence on the vendor’s developments, which indicates high customization levels. In general, innovation is always a major decision driver for considering a new PMS solution. Four in 10 hotel chains consider their existing PMS solution as sufficient. The same number of chains is unaware of suitable alternatives and avoids investing in a PMS solution that potentially does not offer significant benefits, while simultaneously posing a high commercial risk. 32% see beneficial commercial conditions with their current PMS vendor. While the depth of integration is extremely important to the hotel chains’ decision to maintain the current PMS solution (34%), only 16% stay with their existing vendor company because they are innovative. Three in five hotel chains prefer a “Pay-As-You-Go” license model versus paying for the complete PMS suite of services. However, one quarter is undecided due to potential hidden costs and CAPEX versus OPEX considerations, among other reasons. In general, hotel chains expect better cost efficiency, increased flexibility and customization from a Pay-As-You-Go model. 13% do not prefer a Pay-As-You-Go model for various reasons, such as, for e.g., their existing commercial model is flexible. Just 18% prefer a “standard” pricing system. 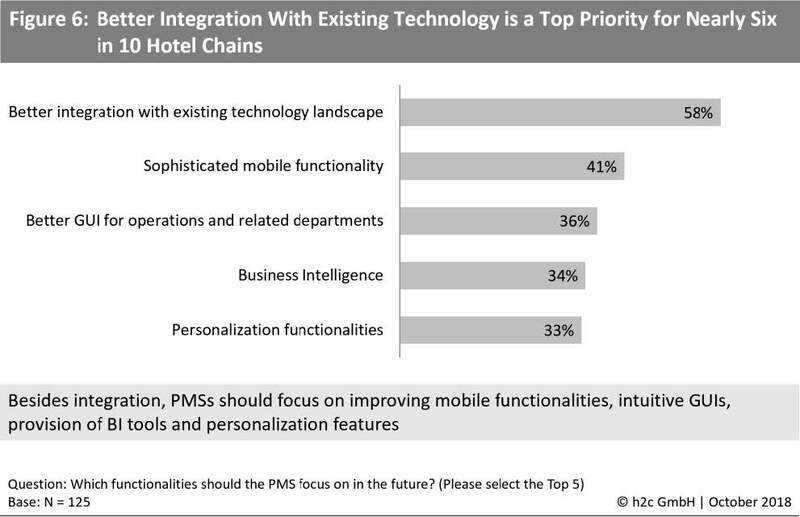 When asked which functionalities the PMS should focus on in the future, 58% chose integration with the hotel chain’s existing technology landscape as being most important; followed by mobile functionalities (41%); and better/intuitive graphical user interface (GUI) for hotel operations and related departments (36%)—see Figure 6. Business intelligence and personalization functionalities (e.g., custom dashboards and developments) follow with 34% and 33%, respectively. Today, only 38% of hotel chains employ guest-facing technology including, for e.g., in-room streaming, voice-controlled illumination or temperature regulation, and mobile key services. 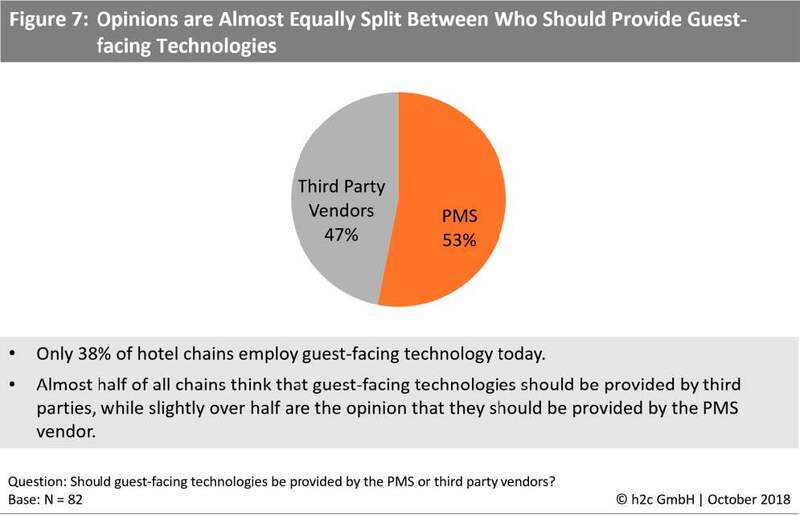 While slightly more than half of the hotel chains suggest that the PMS vendor should provide this technology, the other half prefers third-party suppliers to manage parts of the customer journey (see Figure 7). Today’s low adoption rate of this technology is a strong call to action for PMS and third-party vendors alike. Less than half of all hotel chains use the PMS as the leading system for managing their loyalty program. In Europe, 36% of the hotel chains manage their loyalty program via the PMS. However, 34% of all European chains have not implemented a loyalty program. Asia puts the strongest focus on the PMS as the leading system (66%). About one quarter of all hotel chains do not have any loyalty/rewards program in place today. When asked which alternatives they would consider for managing loyalty, 53% mentioned a CRM solution and 25% are looking for a different kind of third-party solution with PMS integration. 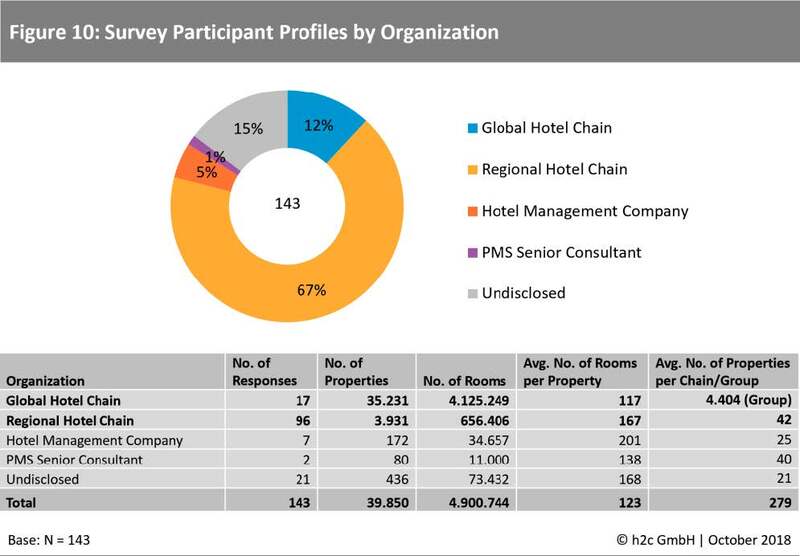 For 87% of the hotel chains, the PMS is their major guest profile management system (see Figure 8). 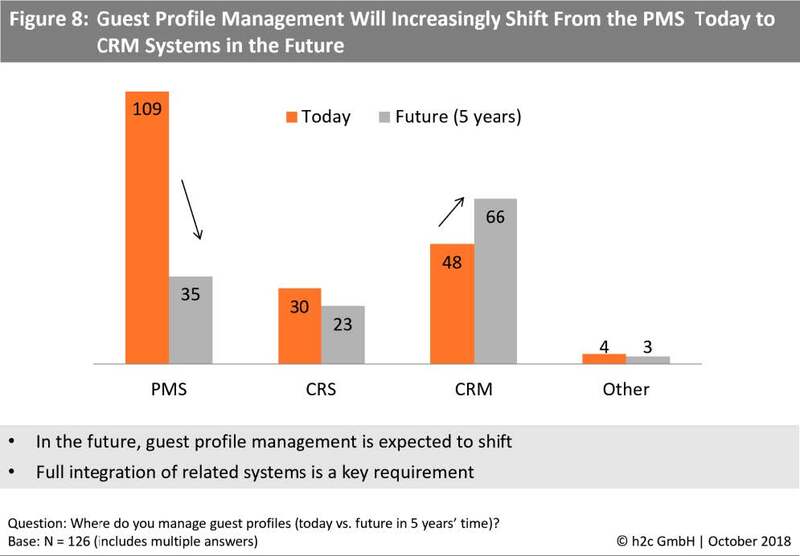 However, in the future, only 28% expect their PMS to continue managing guest profiles. While the CRS also faces a slight drop in guest profile management, CRM systems are clearly expected to take on a more important role in the future. This trend is confirmed by h2c’s Global CRS study results of 2017. As the increase in future CRM system usage does not make up for the PMS’ loss, there seems to be more emphasis on employing third-party integrations, especially via open APIs. 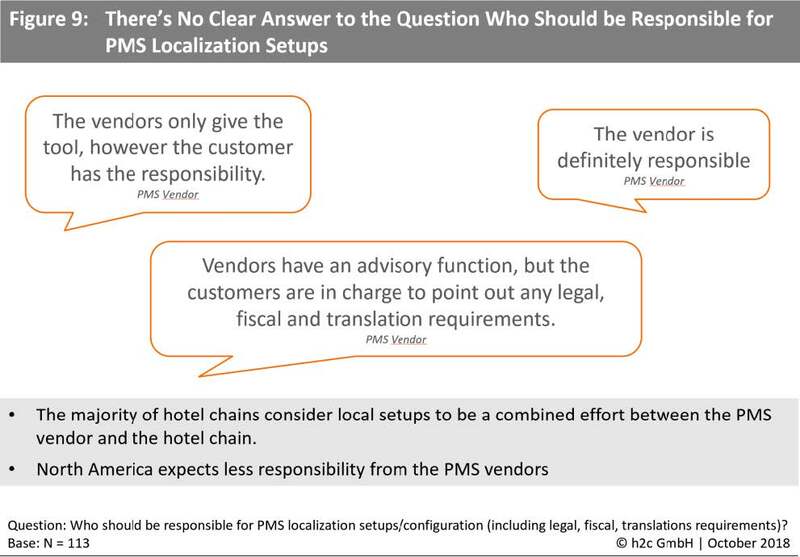 Local configurations such as legal, fiscal and/or translation requirements are generally seen as a combined effort between the PMS vendor and the hotel chain (see Figure 9). Most hotel chains expect a better support in this area, even if they think the responsibility lies with both the hotel chain and the vendor company. North American chains expect less localization services from their PMS vendor. When asked where the main areas of conflict lay among hotel internal stakeholders requiring PMS services, the various hotel chain stakeholders and departments generally expressed differing expectations. While responsibilities cannot lie with IT alone, operations and IT need to collaborate better to improve the system’s usage and acceptance. One third find it challenging to agree on the role of the PMS in each department’s operations including the integration of different business areas. Financial issues, missing procedures, and undefined roles are further points of contention. Although h2c’s research outcome is not considered as a blueprint for “The PMS of the future,” this report highlights numerous service and functionality gaps as well as the hoteliers’ expectations. With this information (based on 140+ pages of the full research paper), both technology provider companies and hotel chains will be able to define and develop suitable hotel management systems to meet future needs. According to h2c’s 2017 Global CRS study and supported by the findings of this research, we see a confirmed trend that PMS and CRS systems will increasingly merge in the future, either in the form of hybrid solutions or as entirely new hotel management platforms. This study combines the findings from an online survey (completed by 112 executives of global and regional hotel chains) and executive interviews (38 hotel chains, and 13 technology providers including sponsors). Some findings are complemented by h2c’s secondary research. In total, the study includes the answers of 110 unique hotel chains and covers the following regions: Europe, Middle East & Africa, the Americas and Asia Pacific. More than half of the study participants (57%) are from IT and revenue management functions. Designed on a global level, the study has a fair distribution across hotel categories by star rating, type (global and regional hotel chains), and location (city, airport, convention). The surveyed 110 hotel chains, whereof the majority is regional, represent more than 39,850 properties and 4.9 million rooms worldwide (see Figure 10). Founded in 2001, h2c provides professional services focusing on hotel chains’ marketing and distribution solutions. Our Mission: “H2c inspires success in hospitality commerce. Our passion to translate marketplace complexities into actionable strategies shapes our relationships. The goal: clients are confidently in control.” For more information, please visit our website. Our next custom research project has a focus on Customer Relationship Management (CRM) and Guest Data Management and will launch in November 2018. If you are interested in becoming a sponsor or partner please view the prospectus for more information on h2c’s Global CRM Study. For more information, please call +49 239 836 0 or contact Michaela Papenhoff directly. All h2c publications are protected by copyright according to German law (§ 106 ff Urhebergesetz). It is not allowed to copy, fax or electronically distribute copyrighted material without explicit permission. You may not copy, reproduce, modify, republish, upload, post, transmit, or distribute, electronically or otherwise, any h2c report in any form or by any means without prior written permission from h2c GmbH. Any unauthorized use of the materials may violate copyright, trademark, and other applicable laws and could result in criminal or civil penalties.